This was largely due in part to a government that understood very early on the need to integrate health with every aspect of urban planning. Housing, water, food, air quality, road traffic, parks, is all seen as key components in a holistic health system(4) . In the early years of Singapore’s independence, health issues mainly pertained to poor nutrition and hygiene factors. Health education focused on teaching a largely uneducated population to practise preventive measures like hand-washing and boiling drinking water. As Singapore developed, the government started putting in place accessible and affordable quality health services. The investment in the health system was complemented by further government investments in an effective public health system such as the provision of clean drinking water and good sanitation, the enforcement of food safety standards and pollution control. Singapore also set up an entire government agency, the Health Promotion Board (HPB), which is dedicated to promoting healthy diets, exercise, health education and regular screenings among Singaporeans. School-going children undergoing health checks carried out by the Health Promotion Board’s School Health Service(5). With the government’s commitment to create a holistic health system, Singaporeans are now able to reap the benefits of medical technological advances and accessible quality medical care. This was a far cry from the 1950s and 60s when there was a lack of access to basic medical care and children were undernourished. 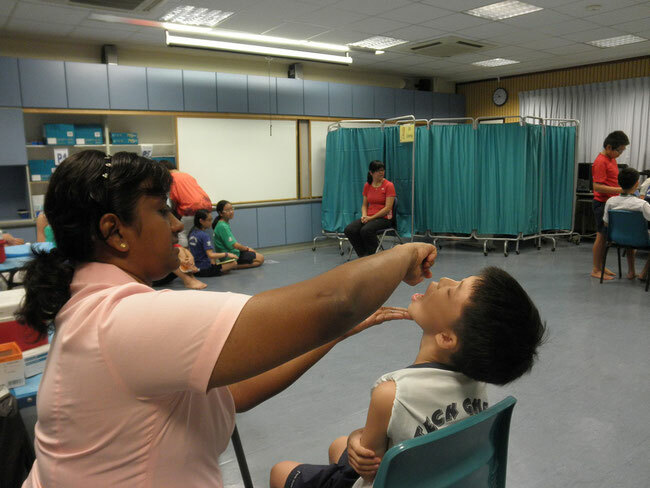 At the same time, the country has also experienced improvements in its health outcomes, with health promotion efforts playing an integral role in shaping the health of the Singapore population. Today, Singapore’s obesity and smoking rates are the lowest among the OECD countries(6) . As the Singapore’s economy improved, so too did the lifestyles of its population. Growing affluence with increasingly sedentary lifestyles meant that health issues started to shift from those of malnutrition and infectious diseases to non-communicable diseases. By 2010, about 70% of the burden of premature deaths and ill health in Singapore was caused by non-communicable diseases such as diabetes, heart disease, and cancer(8) . Nearly a quarter of this burden of disease had been attributed to modifiable lifestyle risk factors, with the top two being high body mass and cigarette smoking(9) . Singapore’s population is also rapidly ageing. The number of people aged 65 and above has been projected to more than double from 405,000 to 900,000 by 2030(10) . This means that it is highly likely that more people will suffer from non-communicable diseases in the next decade. This has also been compounded by a sharp increase in obesity rate from 6.9% to 10.8% between 2004 and 2010(11) . The Saw Swee Hock School of Public Health (SSH SPH) has projected that one in nearly six people in Singapore will be obese by 2050(12) . Besides obesity, smoking is also a problem. Despite strong legislative measures, smoking rates among adults crept up to 14.3% in 2010 from 12.6% in 2004(13) . 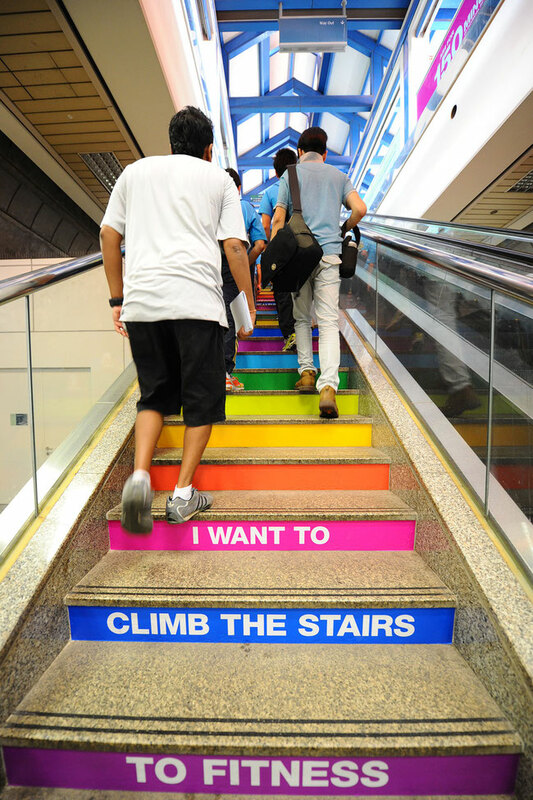 An example of a visual cue to 'nudge' Singaporeans to use the stairs. With a constantly evolving health landscape, there is a continuing need to review current efforts to harness new opportunities and deal with emerging challenges to help Singaporeans adopt and sustain healthy habits. Surveys(15) conducted showed that even though many Singaporeans appreciated the importance and benefits of healthy living and healthy lifestyle habits, it could be challenging for individuals to put these into practice due to the many competing needs and wants in their daily lives. In response to this and to facilitate the integration of nation-wide efforts in enabling healthy living, the Healthy Living Master Plan Taskforce was formed in September 2012. The aim of the Taskforce was to review the existing health promotion and disease prevention landscape in Singapore and to formulate a systematic plan, consolidating the inputs of various public agencies and community organisations, along with views from the public. These efforts culminated in the Healthy Living Master Plan. Launched in 2014, the Master Plan aims to make healthy living accessible, natural, and effortless for all Singaporeans. Through this Master Plan, it is envisioned that Singapore in 2020 will have healthy living at the “doorstep” of every home, workplace and school, so that Singaporeans can embrace healthy living as part of their everyday routine. To realise the vision of “Healthy Living Every Day”, a two-pronged approach is key – a whole-of-government effort and co-creation with the community. Above and beyond these two prongs, to create an environment supportive of healthier choices, the government also partners the private sector to “tilt the market” so that supply would be generated and demand created for more healthier options in the market. “Singaporeans agree more can be done to improve their health, particularly in the areas of physical activity and regular health screening. However, such awareness has not yet prompted Singaporeans to proactively adopt a healthier lifestyle”. HLMP anchor initiatives at a glance. Governments today have had to adopt whole-of-government thinking as a matter of necessity, as issues become increasingly more complex and multi-faceted. This approach helps governments to tap on diverse knowledge, viewpoints and ideas from across the public sector, creating synergy as different agencies come together to broaden and deepen policy development. Concerted and coordinated whole-of-government efforts often achieve greater outcomes than the most competent agencies working alone(17) . Health is no exception to complexity. Health authorities worldwide have increasingly recognised that lifestyles are influenced by a myriad of factors which do not fall entirely under the ambit of the health sector. Social, cultural, physical and economic factors(18) play a role in determining whether one will chose an action that is healthy or not. The Singapore government’s approach is to change the context to make the individuals’ default decisions healthy, regardless of education, income or other societal factors. Changing the context means that individuals expend less effort to benefit from these interventions as healthier options become more and more a natural part of everyday life. Acknowledging the multi-dimensionality of health issues and that the whole is greater than the sum of its parts, a whole-of-government approach is used to influence behaviour change across the key settings of the school, workplace and community. From the start, health promotion has had a strong foundation in schools. Health services in schools were introduced as early as the 1920s to ensure the proper development of children. An effective school health programme is considered as one of the most cost-effective investments for a country to improve both education and health(19) . Establishing good eating habits from young can also help children maintain healthy weight and normal growth. They are also more likely to maintain a healthy lifestyle when they become adults(20). This makes the school an ideal platform to reach and positively influence the health of school-going children, youth and their families. Strong partnerships are essential to effectively influence behaviour change in students. In the preschool setting, the Early Childhood Development Agency (ECDA)(21) , the public agency looking into early childhood education, is a key partner. Beyond preschools, the key partners are the Ministry of Education (MOE) for both primary and secondary mainstream schools, and the respective Institutes of Higher Learning(22) for the various tertiary institutes. Working together with these partners creates synergy in bringing health promotion programmes to the hundreds of thousands of school-going children and youth. Decal in a school promoting healthy eating habits. One key initiative to cultivate healthy habits is to ensure that children and youth are eating well-balanced and nutritious meals. 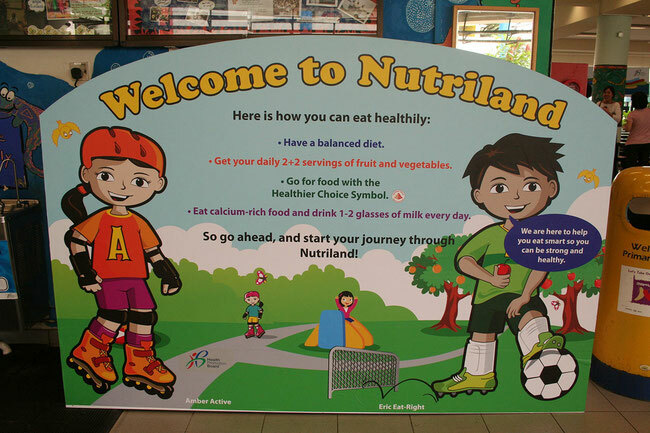 The “Healthy Meals in Childcare Centres Programme”, the “Healthy Meals in Schools Programme” for primary and secondary schools and the “Healthier Dining Programme @ ITE(23) ” focus on developing environments that foster healthy eating, thereby allowing children and students in these institutions to have convenient access to healthier food and beverage options. Cooks and canteen vendors from some of the participating institutions have begun receiving hands-on culinary training from nutritionists and chefs in the preparation of healthier and tasty food. 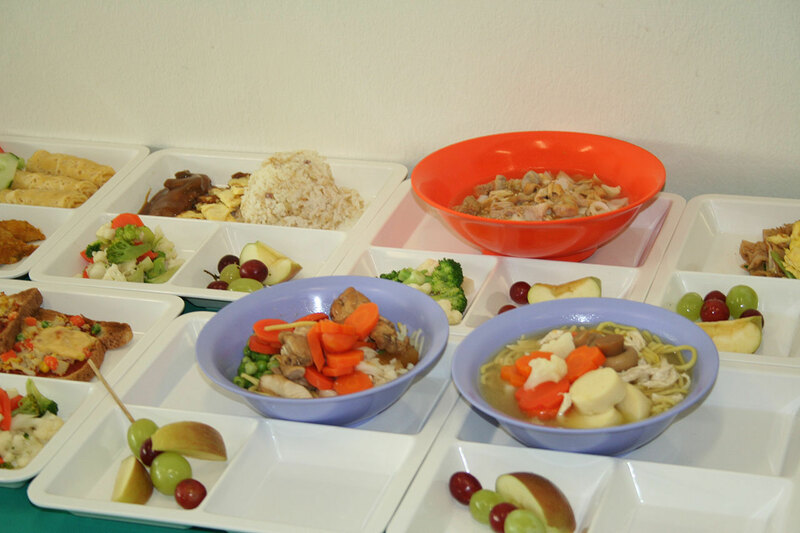 Examples of healthy bento set meals served in childcare centres/ schools. Food stalls in educational institutions are encouraged to offer healthier options by increasing vegetables and fruits in menus, and reducing gravy and fried food. Suppliers are also linked up with canteen vendors to offer wholegrain rice, noodles, bread, and healthier oils. In terms of healthier beverages, currently only drinks with the Healthier Choice Symbol(24) are allowed in schools. The partnership with the Ministry of Education also looks at further reducing sugar content of drinks in vending machines and drink stalls and the aim is for all schools to be on board this effort by January 2016. The Healthier Choice Symbol logo. For children and youth at risk of poor health outcomes, whether due to social or economic factors, a close partnership with the key stakeholders influential in their lives is a critical success factor for effective intervention. This is the purpose of the Student Health Advisors programme which offers deeper engagement with such at-risk students, with the support of the schools. These School Health Advisors have consistent follow-up and interaction with the students. This is done through individual or group-based support that is either requested by the students themselves or through referrals by relevant school staff or the Health Promotion Board’s School Health Service. The support rendered includes mentoring on health issues such as smoking, weight management and mental wellbeing. If necessary, at-risk students are identified to be referred to expert healthcare professionals and to adolescent health services. The presence of the School Health Advisors in the schools strengthens existing health programmes and processes, as they provide evaluation of health promotion activities and health education, and identify opportunities in schools for additional health promotion programmes. The workplace offers an ideal setting and infrastructure to support the promotion of health of a large audience(25) . 67% of Singapore’s residents aged 15 and over are in the workforce(26). At the same time, health trends among the working population are worrying. Obesity prevalence almost doubled among working males, aged 18 to 40 years, from 7.2% in 2004 to 12.1% in 2010(27) . Also, because of Singapore’s ageing population, Singaporeans would have to stay in the workforce longer. Employees who benefit from workplace-based health promotion will stay well longer, ensuring their employability post-retirement. 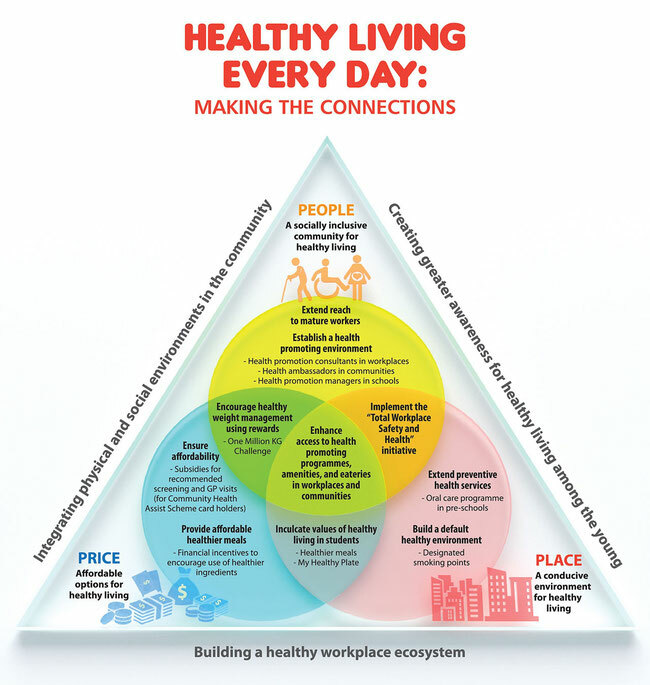 To ensure that Singapore’s workforce remain healthy, as part of the Healthy Living Master Plan, the Tripartite Oversight Committee on Workplace Health was set up in 2013. It oversees and drives the development and execution of a workplace health roadmap, with strong tripartite partnerships that include public sector agencies, employers and employees. With the strong support, the workplace has become one key setting for HPB to extend its outreach to more workers and develop structures and policies to create work environments which support healthy behaviour. A key development under the Tripartite Committee is the integrated approach of “Total Workplace Safety and Health” to managing safety, health and wellbeing in the workplace. Traditionally, organisations tend to focus on issues of workplace safety and workplace health separately. However, it is important to recognise that issues of employee health, safety and wellbeing are interconnected and hence, an integrated approach is needed to better protect and promote workers’ health and safety. Under the Total Workplace Safety and Health approach, workers and managers collaborate in a continual improvement process to protect and promote the health, safety and wellbeing of all workers. With this focus, programmes on safety are integrated with those on health, creating synergistic benefits of improved productivity, reduction in absenteeism, employee retention and improved quality of life(28) . Info-graphic on “Total Workplace Safety and Health” in action. Beyond reaching out to adults who are in the workforce, there is also a need to engage seniors and those who are not part of the workforce. This is the focus of the HPB’s community outreach efforts and creation of health promoting facilities and programmes within the vicinity where one lives. This helps to influence everyday lifestyles and serves as the continuum of nurturing healthy habits which extend from the school setting to the family unit. Taking a leaf out of New York City’s book, the Healthy Living Master Plan brought together all who have a role in the design and construction of the built environment, including planners, urban designers, architects, landscape architects, engineers and government agencies, to create an environment that enables all city residents to incorporate healthy activity into their daily lives(29) . Likewise in Singapore, leveraging connections across public agencies and existing infrastructure that have been built in the community, initiatives under the Healthy Living Master Plan focus on integrating and enhancing such infrastructure to create easy access to health-promoting facilities and amenities. This brings healthy living options to the doorsteps of Singaporeans, making them pervasive and easier for people to opt for. One example of an interagency collaboration is between the Health Promotion Board and the Land Transport Authority on the Walk2Ride initiative. Active commuting is encouraged via improving the walkability and user experience along sheltered linkways between transport nodes (e.g. Mass Rapid Transit train stations and bus stops) and typical destinations (e.g. schools) within a 400-metres radius. This includes having rest areas that are retrofitted with health information and point-of-decision visual cues with health promoting messages. 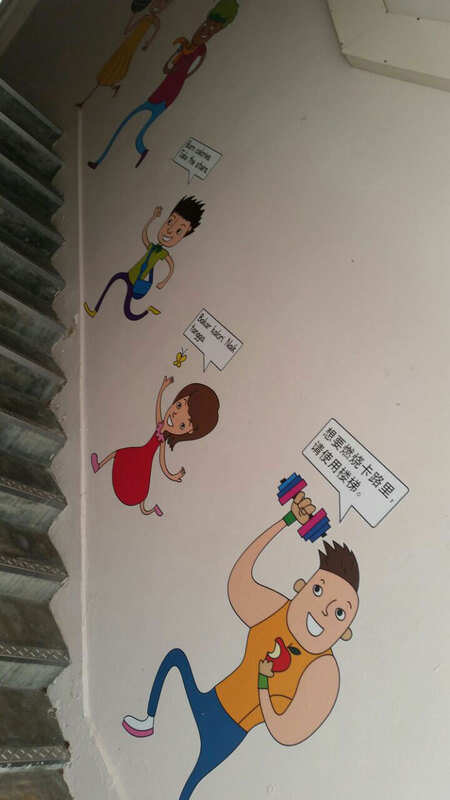 In collaboration with Town Councils(30) , visual cues are also implemented at lifts and stairways of the housing estates to encourage residents to take the stairs instead of the lift. This has been successfully implemented in three towns – Sembawang, Choa Chu Kang and Tampines - since last year. Associate Professor Muhammad Faishal Ibrahim, Parliamentary Secretary for Health (Singapore) and Chairperson of the Healthy Living Master Plan Task Force (2012-2014). 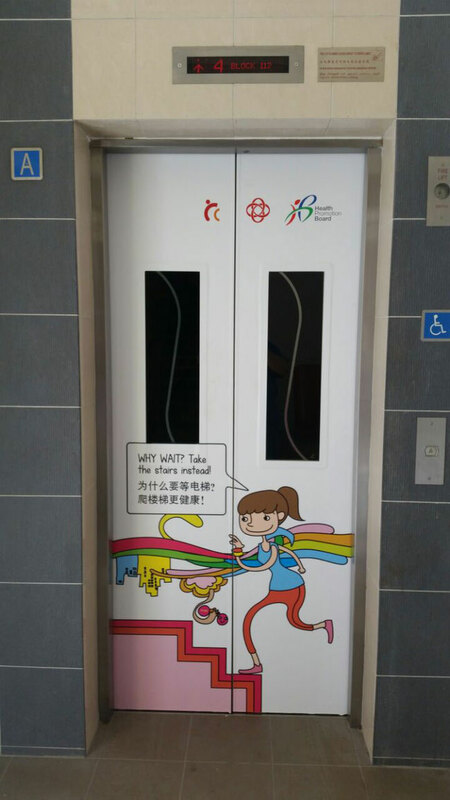 Visual cues in Tampines town encouraging residents to take the stairs instead of the lift. 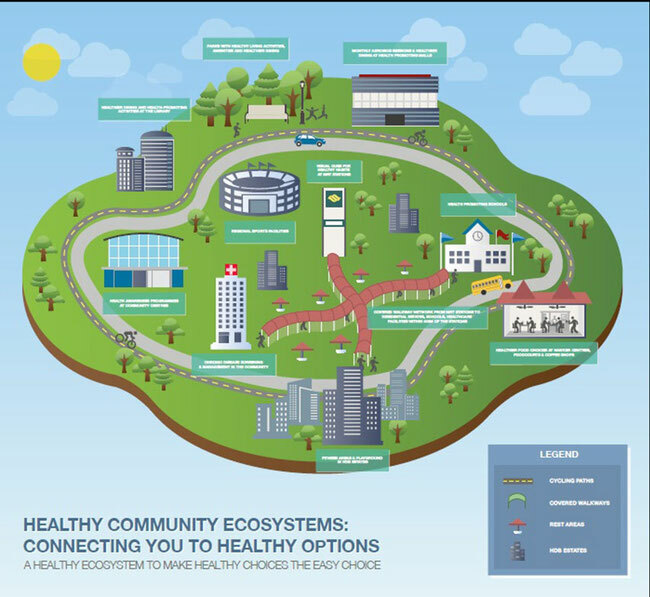 Illustration of a Healthy Community Ecosystem providing convenient access to health promoting options. Beyond physical infrastructure, having convenient access to healthy living programmes also encourages Singaporeans to live more healthily. Leveraging Singapore’s already strong physical infrastructure and good network of parks, programmes have been developed to encourage utilisation of these spaces for physical activity. One such programme is the Sundays @ the Park programme which was introduced in parks located within residential estates. 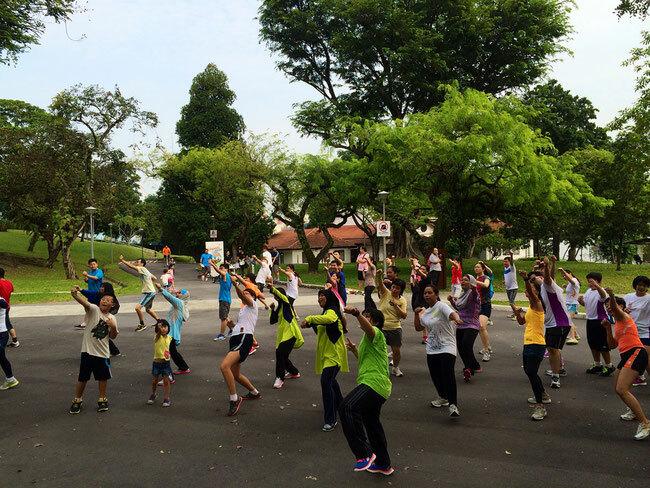 The programme has been well received by residents and is an example of public sector collaboration between the Health Promotion Board, Sport Singapore(31) and the National Parks Board(32) to provide residents with activities that benefit both physical health and mental well-being. Through this partnership, residents can enjoy a variety of fun-filled physical activity programmes with family, friends and neighbours, including group exercise workouts (e.g. Zumba) and fitness boot camps. By introducing these regular programmes, more interest is created among residents to enjoy the parks while participating in sports and adopting healthy lifestyles. This enables the partner agencies to achieve complementary goals with the shared outcome of a healthier and happier community. Residents signing up for Sundays @ the Park Programme. "It is only when individuals are able to exercise self-determination and contribute meaningfully to the communities they live in, that they feel they are fully human, and fully citizens of this country." At the public dialogue session for the Healthy Living Master Plan, the social approach to healthy living came up strongly in the discussions. A number of participants felt that social support and influence were key to changing behaviour. This social element was seen as a strong motivating force to get people to live healthily. This is consistent with the thinking that co-creation of solutions with the people in a community where people on the ground are brought together to solve specific problems, and engenders a sense of ownership of the outcomes. Change is then further deepened and sustained when individuals move beyond their vested interests to care about the larger cause of the community(34) . Therefore, on top of integrating the physical infrastructure and creating convenient access to healthy living options in the residential neighbourhood, co-creating solutions with the community is important in influencing the adoption of healthy lifestyles and complements the whole-of-government effort. In this approach, community leaders are empowered to co-create with the health authorities a vision of health for their community and advocate healthy behaviours. Community leadership, as well as leveraging networks and building relationships on the ground, are critical to the success of the initiatives in the community. One enabler for forging relationships in the community for healthy living is through the Health Ambassador Network. Formed in 2011, the Health Ambassador Network recruits individuals who are passionate about leading a healthy lifestyle to become advocates to inspire fellow residents in their towns to live healthily. Health Ambassadors are equipped with knowledge and skills on health topics, effective communication and mentoring to enable them to reach out through their social networks to inspire others to lead a healthy lifestyle. The more experienced Health Ambassadors are also provided with further training and development to empower them to drive health promotion initiatives. This includes forming and leading interest groups, and mentoring new Health Ambassador recruits within the community. For example, the Fitness Kaki(35) interest group was formed in 2013 by Health Ambassadors who completed the Lose to Win(36) programme to encourage their friends to continue exercising regularly together, thus sustaining the behaviour change. Another example of getting the community involved is in the promotion of smoking cessation through the I Quit Campaign(37) which has been running since 2011. The I Quit campaign adopts a community-based approach to build a social support network to help smokers kick their smoking habits. The movement has reached more than 10,000 smokers through the workplaces, hospitals and community since its launch. The smoker is supported in his journey to quit smoking by his family and friends, and the programme has also carved out a role for successful quitters to help fellow smokers stub out for good. These quitters are given the opportunity to become I Quit Ambassadors for which they are trained and equipped with basic counselling skills. The use of peer support to motivate healthy behaviour change is not limited to the community setting. In the workplace, a sustainable model to encourage more people to adopt healthy behaviour is via persuasive measures, such as social norming. For instance, applying the diffusion of innovations concept(38) , HPB’s iRun initiative taps on early adopters at the workplace to start running interest groups. Through social networks, a ripple effect is created where fellow colleagues and friends are influenced to join or start their own running groups. Over time, as more and more people join the interest groups and adopt healthy lifestyles, the movement gains momentum and becomes self-sustaining when it diffuses through their social circles. The end result of this diffusion is that people, as part of a social network, adopt the same healthy habits as their friends. Working adults participating in the HPB’s iRun initiative. The battle against non-communicable diseases requires a concerted multi-sectoral effort. Involving the private sector is a matter of necessity, given that it is a big player in health – as employers, producers of food, medicines and sports gear, developers of enabling technologies, and as consumers. As such, steps are being taken to engage private sector players to increase the availability of healthy choices through strategic partnerships. With more Singaporeans dining out these days and enjoying a vast variety of food choices, it is easy for people to exceed the recommended daily energy intake. 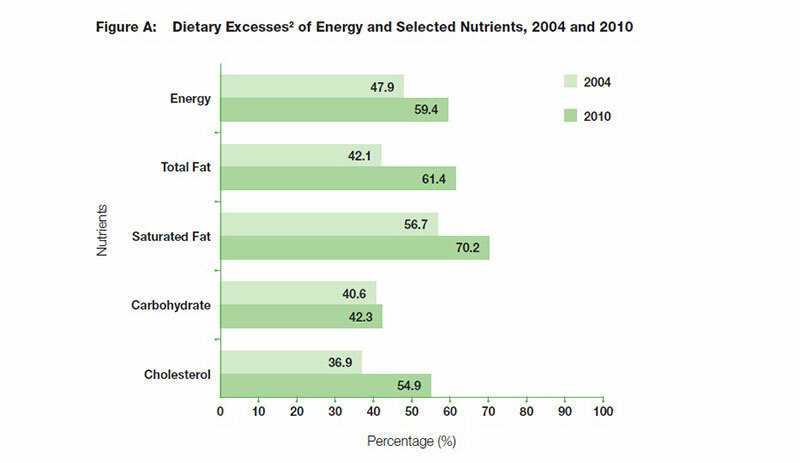 According to the National Nutrition Survey (NNS) 2010(40) , about 60% of Singapore residents exceeded the daily recommendation for energy, an increase from 48% in 2004. As such, tackling the nutritional quality of food as well as the amount that Singaporeans consume is critical in battling obesity. This means working with private sector partners in the food and beverage industry to address these issues. Graph illustrating the National Nutrition Survey (NNS) data showing dietary excesses of energy and selected nutrients among the adult population between 2004 and 2010(41) . Firstly, healthier meals are made more pervasive through the Healthier Dining Programme (HDP)(42) launched in June 2014. Partnering food service providers, the Health Promotion Board is focusing on changing the equilibrium, to “tilt the market” for healthier options by creating supply and generating demand for healthier choices in the whole value chain. Under the Healthier Dining Programme, marketing and incentive programmes like the Healthy-Go-Lucky Campaign(43) encourage Singaporeans to select healthier options, including 500-calorie meals, resulting in reduced calorie intake from the consumption of healthier meals. These changes in dietary habits can then generate new norms on the ground for healthier eating and create demand, enticing more new food business players to come on-board to supply healthier meals. 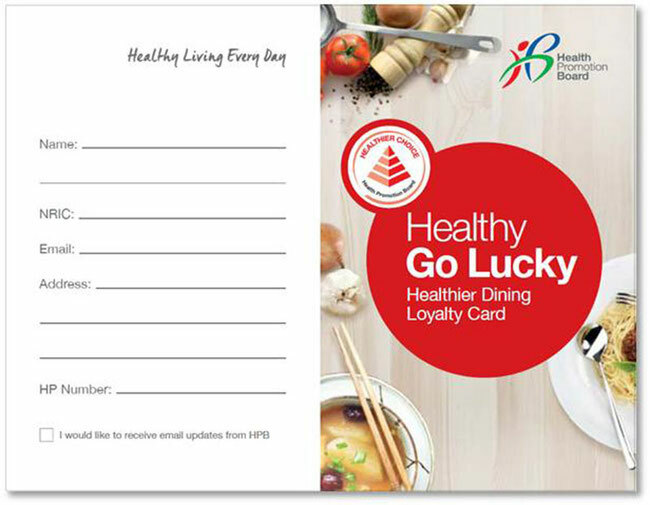 Example of The Healthy-Go-Lucky Campaign loyalty card given to consumers when they dine in at a food partner under the Healthier Dining programme, offering lower calorie meals. With the implementation of the Healthier Dining Programme, 30 food service providers are now offering low calorie meals across some 1,000 food outlets and stalls in Singapore(44) . Most of these outlets and stalls use healthier ingredients, such as healthier cooking oils and/or whole grains. Food stall decal indicating the use of healthier oil. 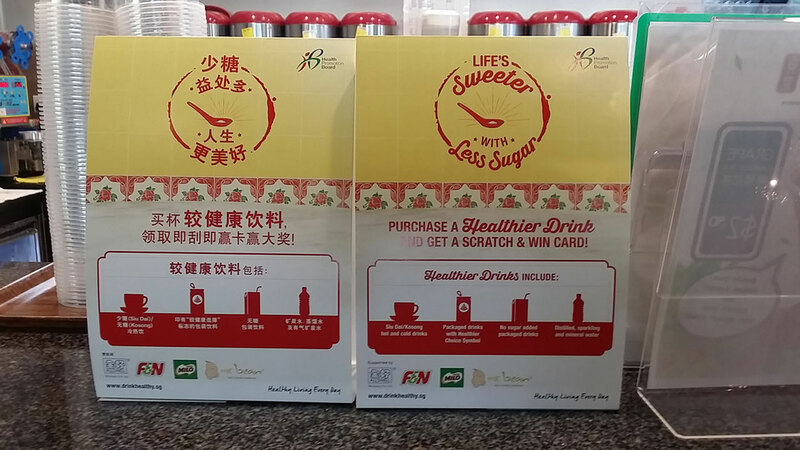 To curb the rising sugar consumption trend among Singaporeans, the “Life’s Sweeter with Less Sugar” campaign was introduced in October 2014 to encourage Singaporeans to choose drinks with less sugar or no sugar. Similar to the Healthier Dining Programme, this campaign works on two fronts. Firstly, on the demand front, the public is nudged through gamification to opt for beverages with less or no sugar, and water. 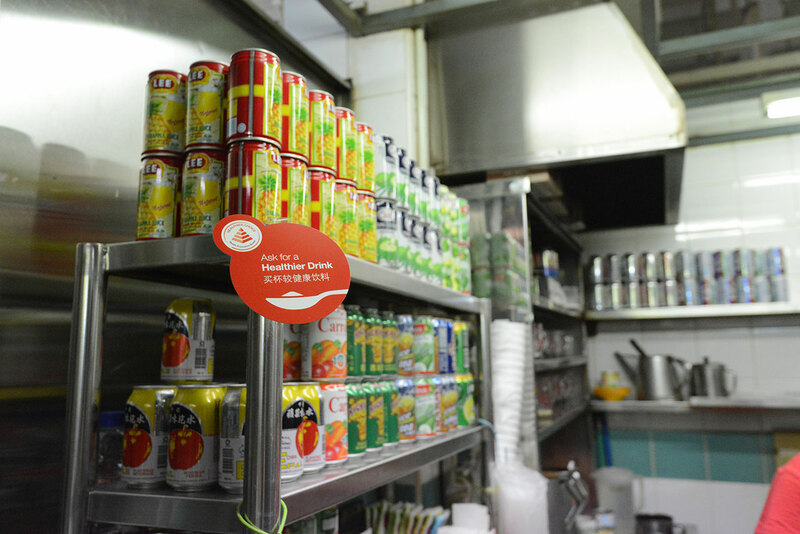 Secondly, on the supply front, a supportive environment for healthy behaviour is created by partnering more than 1,000 drink stalls across Singapore. Drink stall offering healthier beverages with less or no sugar. Scratch and Win card when one participates in the “Life's Sweeter with Less Sugar” campaign. 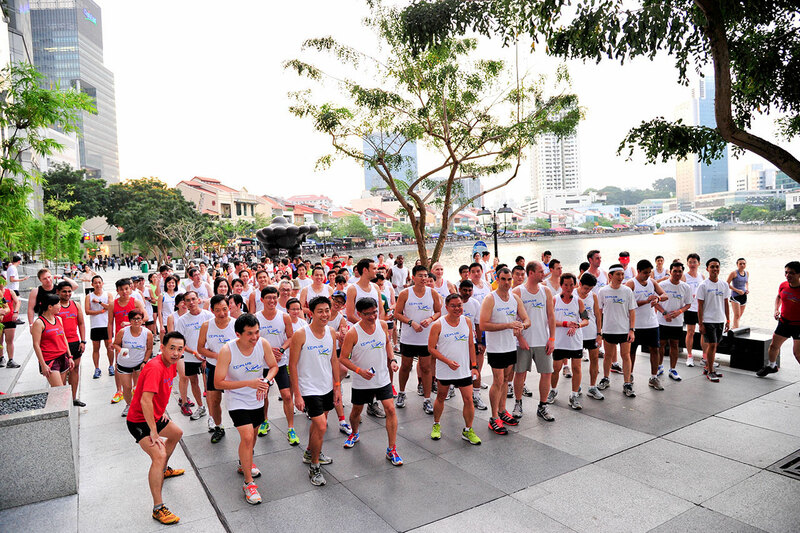 o combat the health issues in a modern and ageing Singapore and aid in the battle against non-communicable diseases, Singapore will maintain its focus on ensuring that Singaporeans adopt and sustain healthy lifestyles. As a “living” document, the Healthy Living Master Plan will continue to evolve as new challenges emerge and other innovative approaches develop over time. Many of the ideas conceived under the Master Plan are innovative and experimental, often with no precedent. However, the underlying premise and objective remain clear - to systemically improve the health outcomes of Singaporeans by bringing together different stakeholders to make healthy living accessible, natural, and effortless. As Singapore continues to experiment, prototype and document health promoting initiatives in its own local context, it aims to build up a repository of knowledge that would be useful for anyone interested in the practice of health promotion and the transformation of health outcomes. (1) Bloomberg. “The World’s Healthiest Countries”, 22 May 2012. (4)Haseltine, William A. Affordable Excellence: The Singapore Healthcare Story. Ridge Books: Singapore, 2013. (5)The School Health Service provides immunization against measles and diphtheria as well as and annual health screening for school-going children. (6)OECD, Smoking (Based on 2011 data) / Obesity : BMI > 30kg/m2 (Based on 2012 data). (7)Opening Address by Director-General of WHO, Dr Margaret Chan at the 8th Global Conference on Health Promotion, Helsinki, Finland, 10 June 2013. (8)Ministry of Health. Singapore Burden of Disease Study 2010. (10)National Talent and Population Division. A Sustainable Population for a Dynamic Singapore: Population White Paper. 2013. (11)Ministry of Health. National Health Surveys 2004 and 2010. (12)Phan TP, Alkema L, Tai ES, et al. Forecasting the burden of type 2 diabetes in Singapore using a demographic epidemiological model of Singapore. BMJ Open Diabetes Research and Care 2014. (13)Ministry of Health. National Health Surveys 2004 and 2010. (14)Committee of Supply 2013. Speech by Minister for Health Gan Kim Yong – Better Health for All. (15)AIA 2013, Healthy Living Survey Index. (16)Haseltine, William A. Affordable Excellence: The Singapore Healthcare Story. Ridge Books: Singapore, 2013. (17)Kharina Zainal. Reviewing Whole-of-Government Collaboration in the Singapore Public Service. Ethos Issue 9. June 2011. (18)World Health Organisation. Commission on the Social Determinants of Health - Final Report. 2008. (19)World Health Organization. School health and youth health promotion. http://www.who.int/school_youth_health/en/ (Accessed 31 October 2013). (20)Health Xchange. Cultivating good eating habits – how to get your kids to eat well. http://www.healthxchange.com.sg/healthyliving/DietandNutrition/Pages/Cultivating-Good-Eating-Habits%E2%80%93How-to-Get-Your-Kids-to-Eat-Well.aspx (Accessed 6 April 2015). (21)The Early Childhood Development Agency (ECDA) serves as the regulatory and developmental authority for the early childhood sector in Singapore, overseeing all aspects of children’s development below the age of 6, across both kindergartens and childcare centres. (22)An Institute of Higher Learning in Singapore is a term for tertiary institutions which includes the Institutes of Technical Education, polytechnics and universities. (23)An Institute of Technical Education is a post-secondary government institution in Singapore that provides pre-employment training to secondary school leavers and continuing education and training to working adults. (24)The Healthier Choice Symbol (HCS) on packaged food products indicates that they are healthier options, and this helps consumers to make informed choices when grocery shopping. (25)World Health Organisation. Workplace: a priority setting for health promotion. http://www.who.int/occupational_health/topics/workplace/en/. (Accessed 31 October 2014). (26)Ministry of Manpower, Singapore. Labour Force in Singapore, 2013. (27)Ministry of Health. National Health Surveys 2004 and 2010. (28)Workplace Safety and Health Council. Total Workplace Safety and Health. https://www.wshc.sg/totalwsh (Accessed 6 April 2015). (29)New York City Department of Design and Construction. Active Design Guidelines: Promoting Physical Activity and Health in Design. 2010. (30)Town Councils were set up following the passage of the Town Councils Act in 1988. It manages the public housing estates and related facilities within its boundaries. (31)A statutory board of the Ministry of Culture, Community and Youth, Sport Singapore’s core purpose is to inspire the Singapore spirit and transform Singapore through sport. (32)The National Parks Board is a statutory board of the Singapore government. 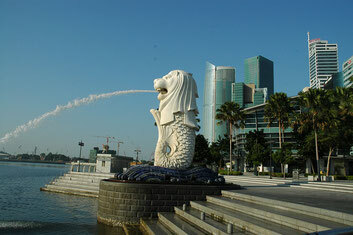 It is responsible for providing and enhancing the greenery of Singapore – a City in a Garden. NParks manages over 300 parks and 4 nature reserves. (33)Laurence Lien, "Singapore's social safety net and the role of the non-profit sector", Speech at Singapore Economic Policy Conference, October 2008. (34)Lena Leong. Engaging the Community to Achieve Better Health for all Singaporeans. November 2012. https://www.cscollege.gov.sg/Knowledge/Pages/Engaging-the-Community-to-Achieve-Better-Health-for-all-Singaporeans.aspx#notes (Accessed 6 April 2015). (35)Kaki: A Malay word which refers to a buddy or someone, one does things with. (36)Lose To Win is a weight management programme by HPB. It is a fun and interactive way to get fit under the guidance of certified trainers and with like-minded individuals, through exercise, nutrition and goal-setting. (38)Boston University School of Public Health; Diffusion of Innovations Theory. http://sphweb.bumc.bu.edu/otlt/MPH-Modules/SB/SB721-Models/SB721-Models4.html. (Accessed 15 November 2014). (39)World Health Organisation. What is the role of the private sector in the high-level meeting on NCDs? http://www.who.int/nmh/events/un_ncd_summit2011/qa/qa6/en/ (Accessed 6 April 2015). (42)The Healthier Dining Programme is an initiative to encourage food and beverage companies to provide healthier meals for their customers (e.g. lower calorie meals and meals using healthier ingredients such as whole-grains and healthier cooking oil). 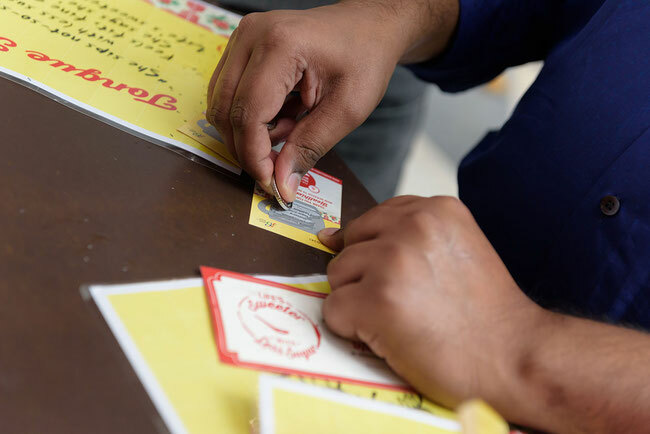 (43)The Healthy Go Lucky Campaign is a reward programme to incentivise people to eat healthily. Singaporeans can win cash prizes when they purchase healthier choice meals at participating outlets. (44)Numbers are as of March 2015.